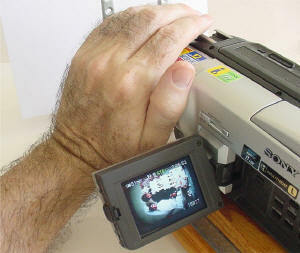 The ideal slide or negative copying environment for ShotCopy is a shaded light source in a darkened room. In many cases this is not a practical environment. Here is a method to help eliminate reflections if it becomes a problem. In the photograph to the upper right you will notice that you can create a light tunnel between the slide/negative holder and your camera lens. This is done by setting up the proper distance for the image to be focused and copied. 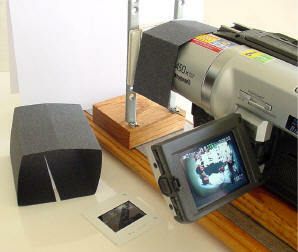 Then cut a strip of flat black construction paper that spans the distance between the slide or negative and the lens. Fold the sides of the strip into a rectangular box that matches the outer dimensions of the slide/negative holder as shown in the picture. Also, you hand can come in handy as a light shield to determine where the light causing the reflection is coming from just before you take the picture. The goal here is to block the light hitting the chrome around the lens or camera body from reflecting on the image to be copied.